I know I'm late to the show with my own blog post about the new happenings issuing forth from the Raspberry Pi Foundation, but I figured better late than never. A few new developments have made news recently and bode well for hobbyists and inventors alike. The first (chronologically) was the release of the compute module. 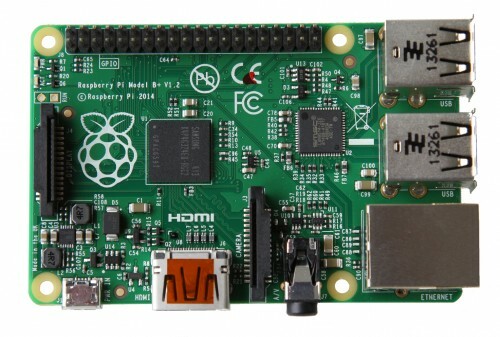 This is a raspberry pi just like any other, except that the whole thing is designed onto a chip that looks just like a laptop memory module. But this is just an example and a board like this could be designed to meet the inventor's needs, changing the number of pins, ports, connectors, etc. 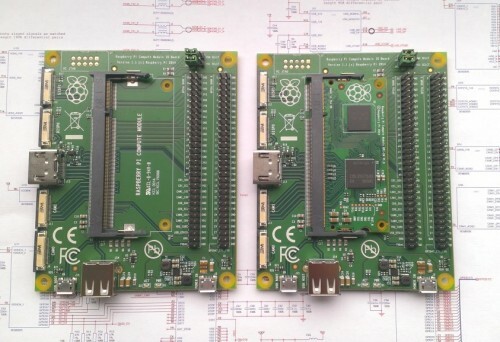 The second bit of gooey goodness is the release of the Raspberry Pi Model B+. This is the next evolutionary (not revolutionary) step in the progression of this little platform. More USB ports - 4 ports instead of 2. Micro SD - the SD is smaller, has a secure latch, and doesn't stick out anymore. Power redesign - the B+ uses less power due to better technology. Better audio - this should be good for my PiTunes. Better form factor - all the onboard ports now only come out of 2 sides instead of the 4. This should make stuffing the Pi into a small corner a bit easier. Also, the mounting holes are uniform and there are 4 of them, which should make building cases a bit easier. Also it helped pave the way for HATs (more on this later). Some good information about the B+. The third bit of really cool news is the release of specifications around HATs (Hardware Attached to the Top). To break it down very simply, this allows add-on boards to tell the Pi that they're connected and give specific information about themselves to the Pi. This could make connecting an add on board very simple since instructions could be included in the add on board itself that help set it up (install software, configure pins, setup shortcuts on the desktop, etc.). I haven't found the official blog post announcing it, but James Adams spoke about it in a recent interview. Here is what they're theoretically supposed to look like. I'm guessing Adafruit will be releasing a HAT starter board soon which would at least include the mounting hardware (since the holes should line up with the holes on the B+) and maybe the EEPROM and other components defined by the standard. In case that wasn't enough, I've seen two articles recently that I've kept in my browser tabs so that I can refer to them the next time I purchase a Pi (usually every other month). The first is an update about the method used by many to turn the Pi into a video game emulator. This used to be a really complicated process that took a ton of time, but thanks to the guys over at petRockBlog and Emulation Station, this process is greatly improved. You can go straight to the source, or you can check out this article which gives instructions for the uninitiated (it's spelled out pretty clearly). I've got a B+ on order right now, so as soon as it comes in, this will be on of the first things I do with it. And if that's not enough, here's an article about the first 5 things to do after powering on your Pi. While installing Minecraft and overclocking aren't required, they are mentioned as the most popular things to do.